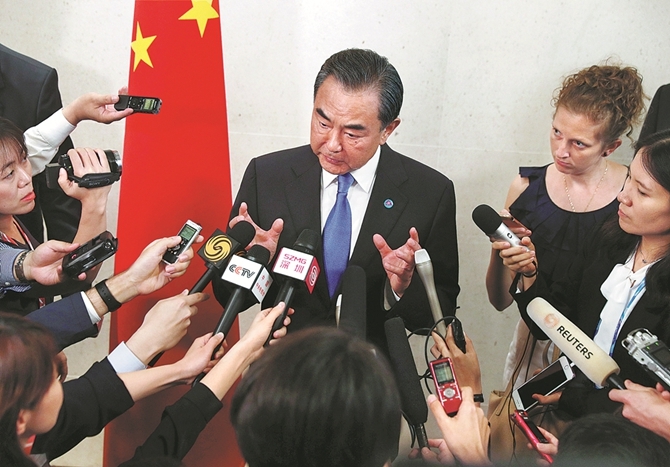 The United States will not only fail to reach its goal but will also reap what it has sown, State Councilor and Foreign Minister Wang Yi said on Thursday in response to Washington's latest threat to ratchet up trade tensions with Beijing. The U.S. "still cannot eliminate what it claims as its trade imbalance" if it reduces imports from China and raises them from other countries, Wang said at a news conference on the sidelines of the annual the Association of Southeast Asian Nations Foreign Ministers' Meeting and related meetings in Singapore. U.S. President Donald Trump has directed U.S. Trade Representative Robert Lighthizer to consider increasing the proposed additional duty on $200 billion worth of Chinese imports from 10 percent to 25 percent, Lighthizer's office said in a statement on Wednesday. In a conference call on Wednesday, two Trump administration officials told reporters that Trump remains open to communication with China. The Ministry of Commerce responded on Thursday that "China has made sufficient preparations" for the U.S. tariff threat, and it will have to take countermeasures to defend the country's dignity and the interests of its people. China upholds dialogue for resolving differences, but treating each other on equal footing and honoring promises are prerequisites for dialogue, the ministry said in a statement. Wang Yi noted that Washington is encouraging the return of production lines to the U.S. while China's domestic demand is rising. "We are willing to import more goods from all over the world that meet the needs of the Chinese market. I think these U.S. enterprises will not give up China's increasingly expanding market," Wang said. In response to speculation that Sino-U.S. trade frictions may affect cooperation between Beijing and Washington on the Korean Peninsula nuclear issue, Wang said China is a country that honors its responsibilities, and it stays true to principles, not trading one for another. "We state our position based on the right and wrong of each case. Of course, we adhere to international justice and basic norms of international relations," Wang added. Lighthizer said on Wednesday that Trump directed the higher, 25 percent tariff because China has refused to meet U.S. demands and has imposed retaliatory tariffs. He said that a public comment period for the $200 billion list would be extended to Sept 5 from Aug 30 due to the possible increase. Products to be targeted range from electrical machinery to leather goods to seafood. The tariff increase proposed on Wednesday is two and half times the amount originally proposed, making it the same as the tariffs the U.S. already imposed on $34 billion in Chinese goods and on another $16 billion in coming weeks. Gary Hufbauer, a nonresident senior fellow of the Peterson Institute for International Economics and a former deputy assistant secretary of the U.S. Treasury, said the impact of the escalating tension is "highly adverse". "This will badly shake business confidence, and firms will delay their investment projects. The world economy will suffer," he told China Daily. Douglas H. Paal, vice-president of the Asia Program at the Carnegie Endowment for International Peace, also said the impact of jacking up the tariff rate will be negative economically, raising costs in every direction and possibly leading to a "wrenching and costly" delinking of the U.S. and Chinese economies if not restrained.